It can be challenging sometimes to find interesting and entertaining activities to for both my kids, and not die of exhaustion in the process. While I have a very energetic young boy, I am lucky to have a really easy girl who's happy to be carried around almost everywhere. 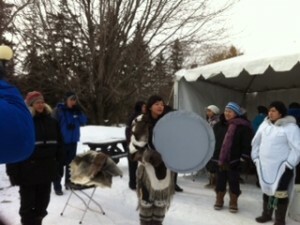 On January 26th, I decided to participate in the Winter Celebration day hosted by the Governor General of Canada at Rideau Hall. It was the weekend after that crazy freezing -40 celsius week we had in January and while the temperature was a bit warmer, I found it was still a bit too cold to bring the baby. My friend was just as happy (happier) to stay at home babysitting, while my boy and I headed to Rideau Hall well dressed, with our skates on my shoulders. We had a blast! Embassies of Finland, Netherlands, Norway, Sweden and the National Capital Commission (NCC) had kiosks where they distributed taffy, cookies, candies, hot chocolate and other hot beverages. We did some crafts at the Netherlands kiosk, we participated in an obstacle course organized by young reservists, took a horse-drawn wagon ride, skated - for a good 2 minutes! (my son is learning to skate this winter...) - on the beautiful historic Rideau Hall skating rink, and enjoyed Inuit dancing and throat singing in their beautiful cultural costumes. There were a lot of other activities for all ages, including cross-country skiing, snowshoeing, dog sledding and a visit of the residence. The event was well attended but not crowded and the only activity with serious wait time was the dog sled rides (which we didn't do). Very well-organized day, all activities were bilingual, and there was something for all ages. And the Rideau Hall grounds are just beautiful! The governer general often organizes days of activities like this one, so it is a good idea to monitor their website. Also, all winter weekends, and on family day, the outdoor skating rink is open to the public from noon to 5 and there is even a possibility for groups to reserve the rink during the week. My son still carries around his little Norway flag that was given to him on that day! This annual event is definitely on my agenda. Stéphanie moved to Ottawa about 10 years ago from the south shore of Montréal. She usually works as an analyst for the federal government but is currently on maternity leave to take care of a 3 1/2 boy (Paul) and 4 month baby girl (Emy).